As we all know Australians love the great outdoors. We also know that when it comes to something adventurous and extreme then Australians are usually the first ones to give it a go. 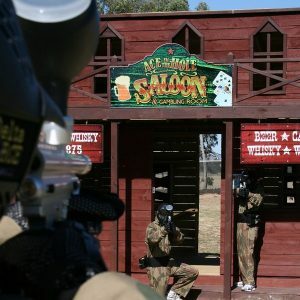 So when we combined the great outdoors with our world-class movie-set paintball fields, it’s no surprise that paintball has become one of Australia’s fastest growing adventure sports. Delta Force is not only Australia’s largest operator of paintball games, but also the largest paintball company in the world. Every week in Australia alone we entertain thousands of adventure enthusiasts looking for the ultimate adrenalin rush. Picture yourself behind the giant sphinx. Your heart is pounding. Your team is ready to make a move. 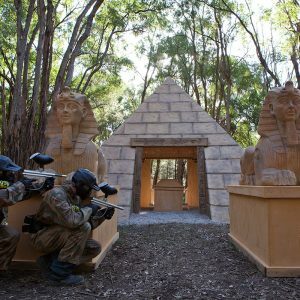 With their cover fire about to start, do you have what it takes to get into the pyramid and capture the ancient artefacts? 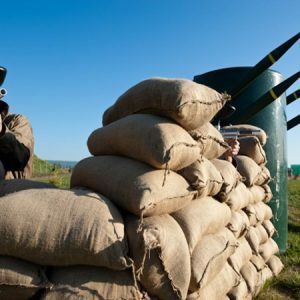 All of our paintball centres take your safety seriously, and you can rest assured that every player in your group will be treated as though they are a celebrity. Our safety standards are the envy of our competitors and we have invested heavily to ensure your day with us is the most comfortable and safest yet. On arrival you will receive all of the essentials necessary for battle, including a goggles with anti-fog lenses, full-length camouflage overalls, custom-designed body armour and a 400-capacity ammunition holder. With movie-set game zones and the best equipment in the industry, come and test your skills at one of Australia’s favourite outdoor adventure sports. For all bookings and enquiries contact us today on 1300 850 744.